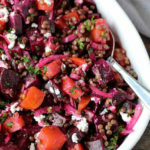 This French Lentil & Beet Salad is an incredibly versatile dish that can be served as a main course for lunch or a simple side dish for a party or backyard BBQ. Lentils are one of those ingredients that seem completely overwhelming to use but are in fact incredibly versatile and are a great staple in any kitchen. They can easily be stored in the pantry and pulled out for those moments when you are just not sure what to make for dinner; combined with a jar of tomato sauce and some simple spices, some humble lentils can go a really long way. One of the biggest benefits of cooking with lentils is how quick they are to prepare and how inexpensive they are to use. Similar to rice, they can be used as a side dish, added to salads, or turned into the main feature by using them in curries, stews and even burgers. In addition to being simple to use, they are a great source of complex carbohydrate and help to serve as a source of plant-based protein as well. When it comes to lentils, there are many different varieties and colours. From red to green, and brown to black, lentils have been used by various cultures for centuries and therefore have uses is so many different dishes. I love using red lentils for soups and stews, like my Lentil, Sweet Potato & Spinach Dahl, and Puy (French) or black lentils for salads and side dishes. Depending on the colour and variety, they will cook in anywhere between 20 to 45 minutes, making them a great choice for weeknight meals. Regardless of what type you use, be sure to rinse your lentils well before cooking and soak before use (when possible) to ensure they are optimally digested. 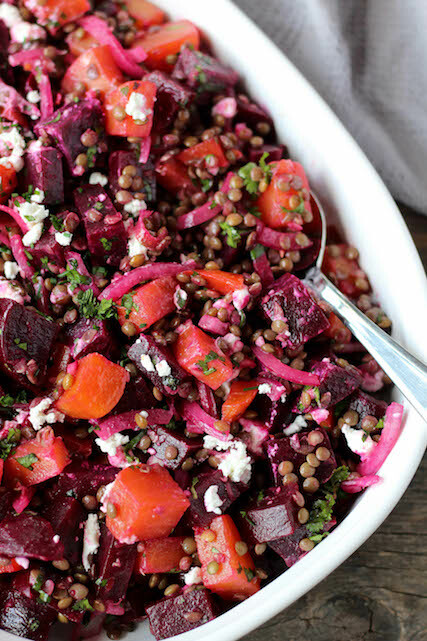 This French Lentil & Beet Salad pairs a sweet, savoury and salty combination of flavours to make an incredible salad that can be stored in the fridge for days to come. I roasted by beets from scratch, but you could also buy pre-roasted beets like Love Beets to help save on time and clean-up. Begin by roasting the beets. Wash and loosely wrap each beet in aluminium foil and roast in the oven for 1 hour until beets are tender. 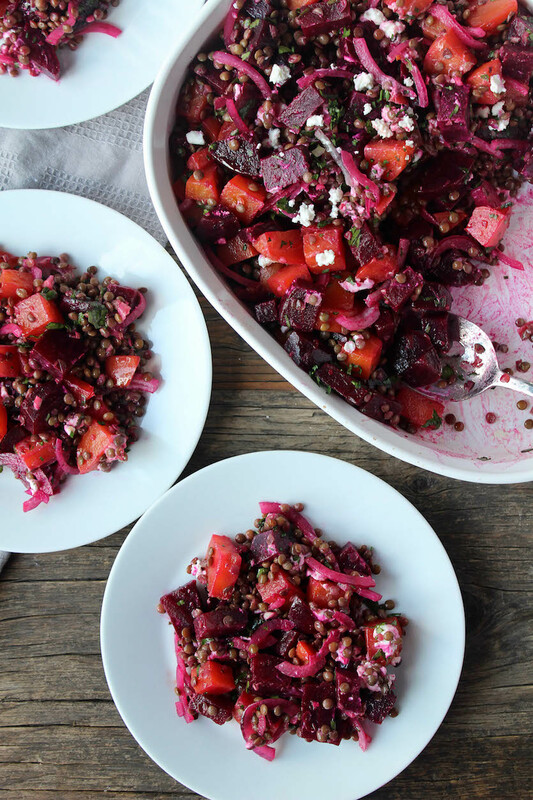 While the beets are roasting, add 1/2 cup of Puy lentils and 1 cup of water to a pot with a bay leaf and bring to a boil. Reduce to a simmer and cook for 20 minutes until lentils are soft but not mushy. You are looking for them to still have a little bite to them. Once lentils are cooked, strain any excess hot water, rinse well with cold water and set aside to cool. Once roasted, remove beets from the oven allow beets to cool, leaving the foil on. 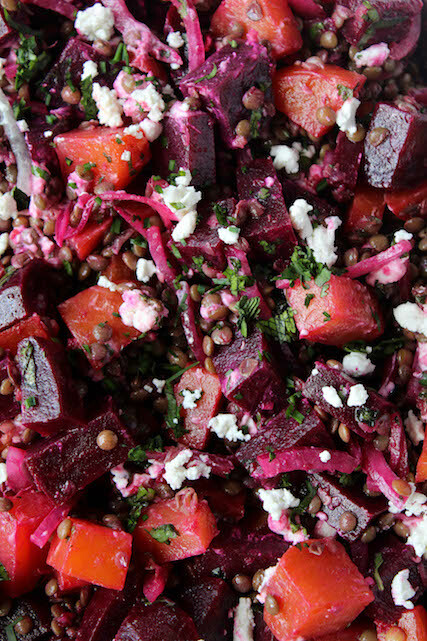 While the beets and lentils are cooling, prepare the dressing. Add all of the ingredients to a jar or bowl and whisk until well combined. Once cooled, gently remove the outer skin from each beet, it should pull off easily when they are roasted. Once the skin is removed, cut roasted beets into cubed bite size pieces. 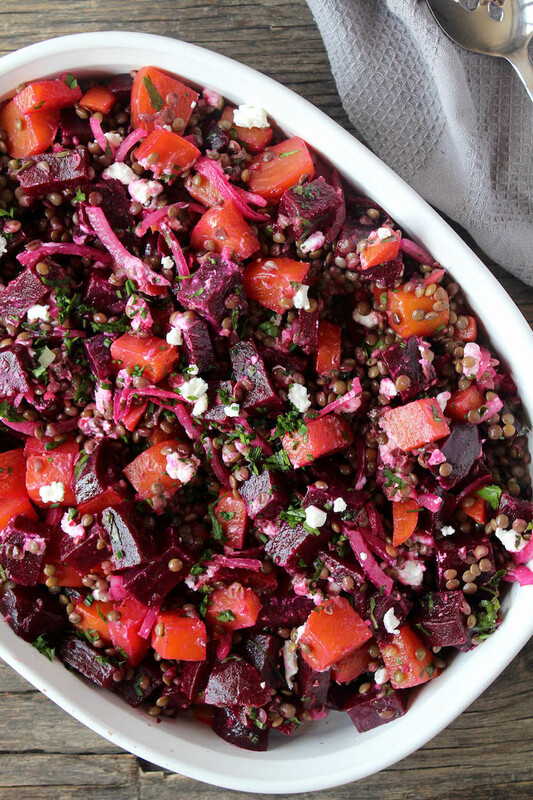 Once beets and lentils have cooled completely, add them to a large bowl to prepare the salad. Add sliced onion and toss to combine with the beets and lentils. Drizzle in the dressing and toss to ensure everything is well coated. Add crumbled goat cheese and fresh herbs, season with salt and pepper to taste, and give it one last toss before serving.